When it comes to redesigning their kitchens, most homeowners think first of their kitchen’s functional aspects: the countertops, the table, the stove, and the cupboards. If you’re remodeling your kitchen, you might put getting new granite, redesigning a new island, and updating old appliances on the top of your to-do list-after all, these changes will make a huge difference in your kitchen’s aesthetic, right? You’re not wrong, but you might be overlooking one of the most crucial parts of your kitchen’s look: its windows. Your kitchen’s windows affect the room’s lighting, obviously, but they also affect how large or small your kitchen appears and contribute to the room’s style and design. Below, we’ll cover some of your options for kitchen window design and help you make the most of your upcoming remodel. Do you simply want to update your windows, or do you want to expand your current windows or build new ones into the wall? Do you want to let more natural light into your kitchen, or are you fine with the lighting as-is? Are you changing your kitchen’s entire aesthetic and style, or are you keeping the style the same and simply updating some of the features? Do you currently have a good view out your kitchen window? Would you like to enhance the view from the kitchen, or does the scenery look fine the way it is? Do you currently have a windowsill where you can set things like potted plants, decorations, or useful kitchen utensils? Do you want one? Is your current window operable, meaning you can open it for ventilation, or non-operable? 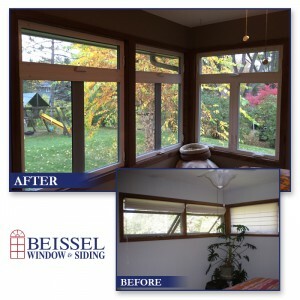 Would you rather have a functional, operable window, or a beautiful, non-operable window, like a stained glass one? As you answer these questions, consider how you want your window to function. Do you want to use it to light your kitchen more naturally and give it a cozy, homey look? Do you want a window over your kitchen sink so you can enjoy a beautiful landscape while you cook and clean? Do you want your window to improve your kitchen’s ventilation? Once you decide on your kitchen windows’ purpose, you can move on to the next steps in this blog. If you want to let extra light into your kitchen, make the room look bigger, or make the kitchen more comfortable by adding in a view of a beautiful backyard, you’ll probably want to add new windows. However, you can’t put in new windows just anywhere in the kitchen. When you plan out a window addition, you need to look at the home’s original blueprints and note the structure’s key points. A professional can help you identify the most strategic points for your new window. Don’t forget to note where the sun rises and sets-you don’t want to be blinded by the setting sun as you prepare dinner. You should also consider the view you’ll get through the window, but don’t forget to think about how the window will change how your home looks from the outside. Your new window’s design will need to match the rest of the windows in the house. Choose a design that will blend nicely with your home’s exterior aesthetic. Awning windows have hinges at the top and open outward. You can place them above, below, or alongside non-operable windows to add a little ventilation. Casement windows have hinges on either the left or right side and open outward. These windows give you maximum ventilation. Picture windows are stationary or non-operable, but they let in the largest amount of light. Slider windows slide along a track to open horizontally. These windows look picturesque while still allowing for adequate ventilation. Bay windows have three angled panels that protrude away from the house. Usually, the middle panel is stationary, but the panels on the side open and close. Bow windows are similar to bay windows, but they usually have four or five panels. Each type of window comes with its pros and cons, and each type suits a c ertain aesthetic-for instance, slider windows usually look modern, while bay and bow windows make a home look stately or rustic. In general, you should choose at least one operable kitchen window. Letting natural air into your kitchen keeps mold and mildew at bay and can freshen the air in the kitchen. No matter which window type you choose, you have several window materials to choose from. Vinyl is affordable and versatile, aluminum is modern and sleek, and wood is timeless. Your interior designer and window specialist can help you find a durable material that also complements your new kitchen’s aesthetic. As you plan your kitchen’s remodel, don’t forget your kitchen’s windows. With the right style, placement, and design, your windows can transform your kitchen into an entirely new, beautiful space. To learn more about which windows to choose for your kitchen remodel, get in touch with a windows expert today.